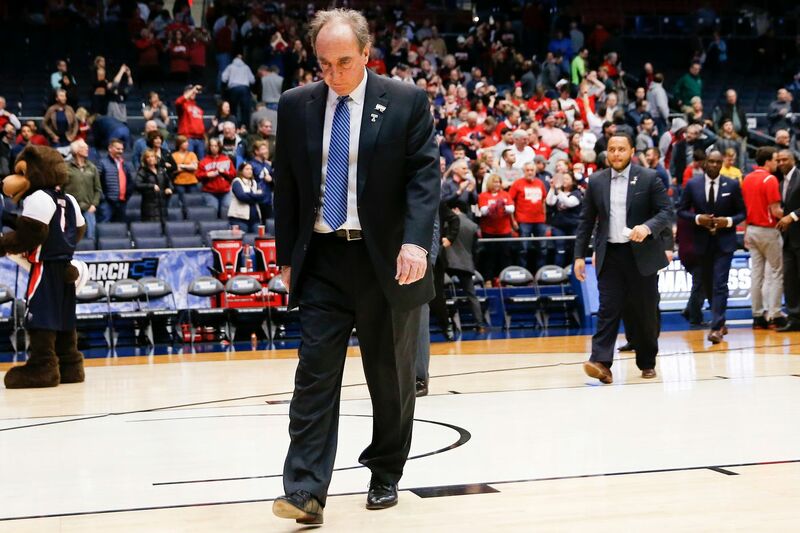 Temple coach Fran Dunphy walks off the court after losing to Belmont, 81-70, in the NCAA First Four at the University of Dayton Arena in Dayton, Ohio on Tuesday. DAYTON, Ohio — A scoring outburst by Belmont during the second portion of the second half ended a season, an iconic coaching career with Temple, and any hopes for Temple of keeping its NCAA dream alive. Even though Temple kept the tempo to its liking, Belmont adjusted and defeated the Owls, 81-70, in Tuesday’s NCAA play-in game at the University of Dayton Arena. Thus the 11th seeded Owls, so excited when they were included in the Big Dance, end their season 23-10. Belmont (27-5) will now face No. 6 Maryland (22-10) Thursday in Jacksonville, Fla. This was the final game for coach Fran Dunphy, who will give way to associate head coach Aaron McKie. During his 30-year coaching career that included the first 17 seasons at Penn, Dunphy ended with a 580-325 record. He was 270-162 in 13 seasons at Temple. The one empty portion on an otherwise exemplary resume is a 3-17 record in the NCAA Tournament. “(I am) very proud of our guys, who they are and how they comport themselves and do a good job,” Dunphy said. He knew he’d be asked if it has hit him that this is his final game at Temple. “No, I’m just disappointed for the guys that we’re not able to continue and go to Jacksonville and play against a team like the University of Maryland,” Dunphy said. All-conference guard Shizz Alston led the Owls with 21 points. Like Dunphy, this was the final game of a stellar career for Alston. Temple trailed by 42-31 early in the second half, but then Alston began scoring and dishing. All of a sudden the Owls led, 52-47, with 11:26 left after Nate Pierre-Louis hit a 14-foot jumper off an Alston assist. That lead evaporated quickly and with 6:12 left Belmont extended its advantage to 63-55 on a three by all-conference guard Kevin McClain, who ended with 29 points. Belmont would increase the lead to 67-57 with 4:08 left on two free throws. by Adam Kunkel. At that point, Temple didn’t have one final run left. Belmont 6-foot-11, 235-pound freshman Nick Muszynski, who missed the Bruins’ 77-65 loss to Murray State in the Ohio Valley Conference championship game with an ankle injury, returned and with a vengeance. The player they call Moose, bulled his way down low. He finished with 16 points, scoring freely with either hand on a deadly jump hook. Temple used its best defensive player, 6-4 sophomore Nate Pierre-Louis on Belmont’s top offensive player, 6-8 Dylan Windler, who entered the game averaging 21.4 points and 10.4 rebounds. Windler was held to five points on an outstanding defensive effort. Windler hit an early three, but Pierre-Louis made it difficult for him to get touches. He had just three points in the first half, but the Bruins had plenty of other options while taking a 37-31 lead. Freshman point guard Grayson Murphy continually blew by Temple defenders and had eight points, four assists and one turnover in the first half. Alston missed his first three shots of the game, but ended shooting 3 for 7 in the first half while scoring seven points. The Temple senior knew he would need to hoist up more shots in the second half. He began the second half on fire but like the rest of the team, struggled in the later portion.